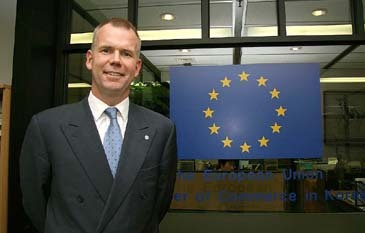 Mr. Carl-Johan Hagman has recently been elected to be president for European Union Chamber of Commerce Korea (EUCCK). Mr. Hagman is president & CEO of EUKOR Car Carriers Inc. The EU is one of Korea's largest trading partners. President Hagman will play an influential role to improve trade relations. The Seoul Times met President Hagman to interview him about the significance of the EUCCK and his plans for the organization. The following are a list of questions and answers. Q1: First of all I would like to offer to you sincere congratulations on your inauguration as new EUCCK president on behalf of all The Seoul Times members. Tell us the guidelines you made to lead EUCCK as its new president? A1: The most important mission for our Chamber is to support European companies doing business in Korea. We believe that Korea and Europe are natural trading partners and that more trade and more investment is good for both Korea and Europe. Q2: What are the most important things you would to achieve within your tenure as EUCCK chief? 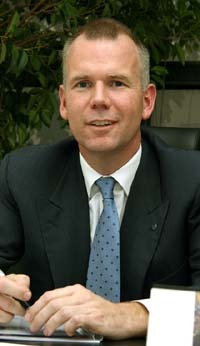 EUCCK President Carl-Johan Hagman poses for camera. A2: I want European companies to continue to be the largest group of Foreign Direct Investors in Korea. This is done by improving the business environment and creating more human relationships. Q3: What do you think is the most desirable role EUCCK should play in promoting business ties between South Korea and EUCCK member countries? A3: Business ties are created by companies. As a chamber we help new companies establish themselves in Korea, we help existing companies extend their network of personal contacts and we try to work with the Korean Government to make policies that will create a more open and foreign investor friendly environment. Q4: Could you tell us the major issues EUCCK face these days? A4: During next year the most important topic will be to facilitate the Free Trade Negotiations between Korea and the EU. In Europe Korea as been identified as one of the priority counties to have an FTA with – which we as businessmen naturally find very encouraging. EUCCK believes that less trade barriers create more trade. The ultimate ambition is to abolish all trade barriers. The benefits of increased trade come in the form of prosperity growth which brings security and stability. 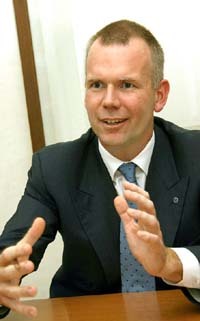 EUCCK President Carl-Johan Hagman poses for The Seoul Times while talking with his staffer in EUCCK's Seoul office. Q5: What are some of the major stumbling blocks to be cleared for EUCCK for promoting business activities in South Korean market? A5: From a foreign investor's point of view, Korea is steadily increasing its attractiveness as a place to do business. Since the IMF-crisis Korea is becoming more and more part of the globalized, high standard industrial world. There is still some way to go, but the important thing is that we are moving in the right direction. Q6: Could you name one or two things the local South Korean government should do for improving overall business environment for EUCCK members? A6: The Government should do all it can to create more smooth labor relations. The recurring disputes, with severe stoppages in industry, is very costly and creates an perception of high risk in Korea. The second issue would be that I would ask the Korean Government to speed up abolition of unnecessary regulations and bureaucracy that too many foreign companies are still facing. 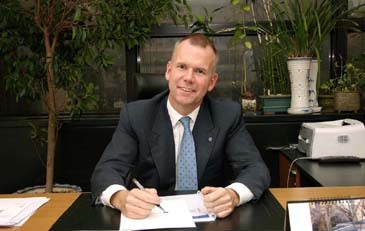 EUCCK President Carl-Johan Hagman gesticulates during the interview with The Seoul Times. Q7: Would you like to compare business environment here in Seoul with other countries you experienced? What are the differences or similarities? A7: In Korea it is very difficult to do business until you have some key personal relationships. When you are on the outside, it is very difficult to get in. However, once you have managed to create trust and respect, Korea is a country that is still very tough to do business in, but you get a fair chance. Q8: Tell us about the strong points of Korean people or Korean businesses in comparison to other countries? A8: In Korea there is a fantastic "fighting spirit" which gives Korean people great tenacity and strength. When other people would have given up a long time ago, Koreans are still fighting. The rest of the world has a lot to learn. Q9: How would you describe Korean people in general or Korean culture? What do you like the most about South Korea or South Korean people? A9: I come back to personal relationships. Once you find friends in Korea you have friends for life. This goes also for business, which makes your business very personal. Korean people in general are not so polite if they do not know you. However, when you have a relationship there is respect, loyalty and friendship in a way which is unique in the world. EUCCK President Carl-Johan Hagman poses in front of his office. Q10: Could you tell our readers about your family? Do they live here in Seoul with you? What do they do? A10: I am married and have 3 children - a girl and two boys. The children go to the Seoul Foreign British School, which we find to be an excellent school of world class standard. Because the children go to a good school and are happy, so my wife is happy. Because my wife enjoys Korea and is happy, therefore I am happy and enjoy my life.